The global healthcare industry is slowly growing as governments spend more on it, implement new technologies like CRM for clinics, and improve the overall quality of service. The Centers for Medicare & Medicaid Services (CMS) predicts that the US will spend 19.9% of GDP on healthcare by 2025 but now this number is 17.8%. Simultaneously, new rules like PAMA and MACRA will cut billions of dollars in hospitals’ and labs’ revenue over the next years. Precisely, Health Affairs estimates that MACRA may decrease average healthcare spending by 2.3% to 7.1% or between $35 billion and $106 billion by 2030. CRM is a promising solution which can help hospitals to overcome difficulties, get new clients, and retain existing ones. 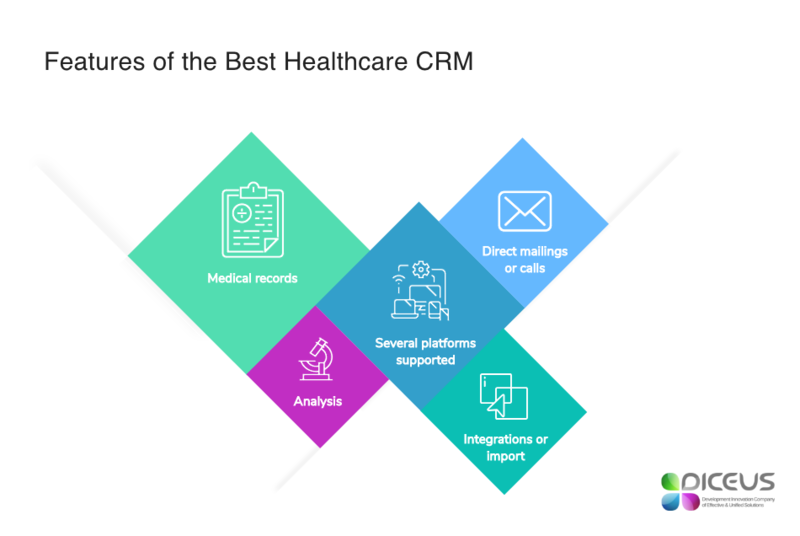 There are various examples of CRM for healthcare marketing which focus on different tasks: better integration with electronic medical records, automation of in-house processes, facilitating billing procedures, etc. Let’s find out how CRM for clinics differ from common systems, what are their benefits, and which product is the best for your needs. Don’t underestimate our today’s topic just because CRM is commonly considered as a tool for sales only. Actually, healthcare CRM or, simpler, HRM is an essential system for modern hospitals, labs, and other medical facilities which have clients and get money from them Non-profit clinics funded by governments are less likely to implement managerial products as they don’t focus on revenues but also work with people. Hence, private hospitals are widely interested in HRM. To interact with patients. Facilitates attracting and maintaining individuals who choose the clinic independently. Includes personalized tasks like sending reminders, survey cards or birthday greetings. To interact with organizations. Helps to get new clients from referrals: private dentists, psychologists, etc. Thus, clinics utilize CRM to keep in touch with these affiliate healthcare providers. Diving into the classification, we can distinguish different technologies: well-known local, cloud-based or mobile CRM plus modern social (for social networks), predictive (for analysis of future clients’ needs), and collaborative CRM (for data sharing between different clinic’s departments). Considering the growing healthcare expenses, you may be wondered how CRM software for clinics is popular. Things are shiny, to be honest. Zion Market Research forecasts that the global HRM market will increase up to $16.5 billion and feature 10.2% CAGR by 2024. MarketsandMarkets insights are even more optimistic as they mark the global growth to $17.4 billion with 14.6% CAGR by 2023. 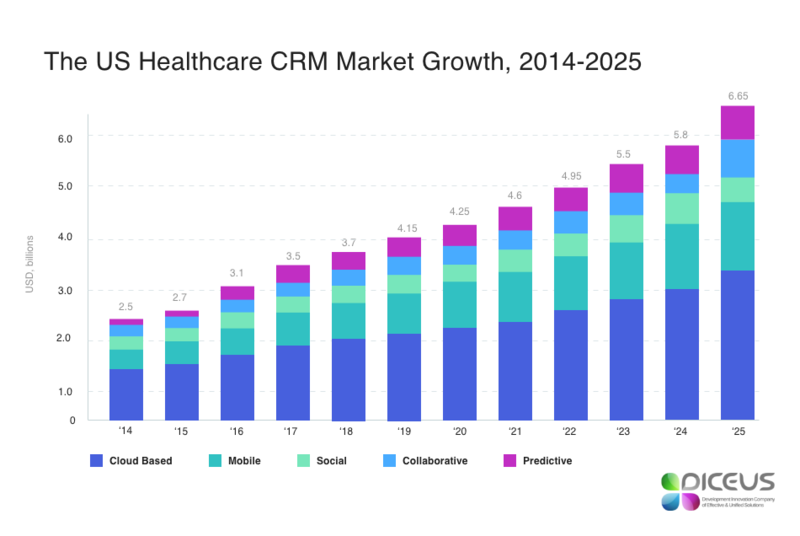 Finally, Grand View Research indicates the US healthcare CRM market growth from 2014 to 2025 with multiple software types included. Structure. Healthcare CRM is prepared for unique structures of clinics. Say, physicians can work in different facilities, so the system has to consider this. Generic CRM supports only one company associated with a worker. Data. Solutions designed for the healthcare industry automatically gather information from labs, payers, and manufacturers to get rid of manual entering. Laws. HRM is compliant with HIPAA, so providers and patients can be sure that their data is safe. On a par with ready CRM software for clinics, specific custom solutions exist. They are totally unique and designed for each customer separately. To get the idea, imagine a SubWay ready sandwich which you can but immediately. It’s a basic CRM or HRM. On the other hand, you can order a unique sub with anything you want inside. It’s a custom CRM. We create such systems to allow healthcare facilities integrate the solution which suits their needs ideally. After discussing and approving all the desired features, we prepare the concept and announce the final cost which includes support and maintenance, too. The best thing about tailor-made CRM for healthcare marketing is that you don’t have to order extra expensive add-ons as everything comes in the package. Now, let’s look at the primary benefits of the described systems for healthcare companies. We will focus on three basic points which are exclusive for the industry but you shouldn’t forget about general pros of CRM: personalized offers, automated processes, integrations with other services like telephony, catalogs, etc. When it comes to the best CRM software for clinics, we have the following improvements. You know these stories about duplicated data, lost healthcare records, and redundant cards which are too complicated to find and use properly. HRM automates and facilitates the whole process of intake, treatment, and further care. CRM software for clinics records sensitive data and prescriptions, tracks the in-hospital activity, reduce potential errors or miscommunications. Thus, the overall quality of service rises. Way more, CRM for clinics can be the difference between life and death. When emergency teams have easily-accessible patients’ medical histories with allergies and drugs used, they can help him or her more efficiently. Often, it happens that a client feels uncomfortable because he or she doesn’t know what’s happening. Best CRM software for clinics engages patients in the treatment process, so they can easily check their records and look at upcoming procedures. Moreover, doctors can interact with inmates all the time controlling everything from the initial consultation to tests’ results. It’s even more important because laboratory tests influence 70% of final treatment decisions and cover 80% of medical records. Hospitals and large clinics are complex structures which consist of numerous departments. Along with treatment-related sections, there are administrative offices which are responsible for billings. Obviously, it’s difficult to deal with care and accounting simultaneously, so even minor problems like expired insurances can cause total chaos. In this case, CRM for clinics is wonderful as they free staff from a lot of manual procedures. Software records and tracks all patients’ billing data, insurance information, schedules, and banking methods. Programs register any changes instantly, so administrators and physicians can focus on the treatment itself. Electronic records. The core of any healthcare service includes all statistics and data such as personal info of a patient, medications, and appointments. Records should be accessible and understandable for doctors and clients, as well. Analysis. To enhance the business, consider reports and dashboards which include global stats. They are similar to medical records but focus on groups of patients rather than on a single person. Direct mailings or calls. Greeting emails, reminders, notifications – all the stuff helps in engaging and retaining inmates as they feel more involved and you will be sure that they don’t forget about another one vaccination. Integrations or import. Unless you are just starting the business, you will have to either integrate CRM or transfer data from previously used systems. Both processes must be simple and quick to avoid info or money losses during the transition period. Several platforms supported. This feature isn’t necessary but highly recommended. Patients and employees will appreciate the ability to check data or modify records from different devices: desktops, tablets, phones. More on this topic: How to Provide Needed CRM Integration. If you realize that your private hospital requires more tools, consider ordering a custom solution. Such CRM for clinics can be packed with any desired feature, so you will be able to serve clients perfectly. There are hundreds of miscellaneous CRM products divided by deployment (cloud-based, on-premise, mobile), pricing model (free, with monthly/annual charges, with a single payment), and features available. CRM for clinics is a less popular sector but it also includes different products which you can check at Capterra, for instance. Prices of this software vary from $20 to $200 per month per user. However, if you want to get the best CRM software for clinics, consult with development teams who design tailored solutions. Our company focuses on quality, so we consider all wishes to create the perfect match for you. Note that such custom products are always quote-based which means we discuss the final cost with each client individually. Everything depends on your needs, at all. In-depth document management. Facilitates tracking and changing e-records. Self-service tools. Useful for patients who want to know more about treatment. HR and staff features. Include compensations, workflows, and events. Smart administration. Packed with employees’ profiles and notifications. Analytics. Collects clients’/workers’ data and presents visual performance reports. The US health spending was $3.5 trillion or more than $10K per person in 2017. The CMS predicts the growth to $5.7 trillion by 2026, so it’s obvious that governments and customers focus on reducing costs and increasing quality. With traditional business and tech models only, modern clinics have no chances to succeed. They should look at advanced software solutions to deliver the best experience and remain profitable. Integrating custom CRM for clinics is a solid approach as it simplifies and automates essential processes, engages patients, and facilitates managerial and marketing tasks. If you want to catch the wave, contact us today, and get a basic exclusive business analysis for your hospital.